In the fall of 2017, in Peru, Illinois, an armed suspect has barricaded himself inside a suburban home after firing at police officers. The apparent suspect’s emotional instability, the fact that the suspect was former military with explosives experience and the threat he made of placing IEDs around the house are making the situation worse. Well over 150 public safety personnel surround the house. Fortunately for the tactical teams and emergency response crew, the suspect is willing to negotiate. As the day wore on, the incident commander knew that the coming night would only complicate the situation. He asked his team what options they had. Chief Ed Rogers, of the Utica Fire Department, immediately thought of the Lynwood Fire Department and their UAS operations program. Thermal imaging paired with a clear aerial view of the house would provide acute situational awareness in case the suspect made a run for it. After receiving the call, Keenan Newton, Lieutenant and UAS coordinator of the Lynwood FD, arrived on site before dusk. As he and his team began unloading their equipment, the suspect told the negotiator that his phone was low on battery. Negotiators knew they had to keep talking with the suspect to help ensure a peaceful outcome. It was a tense moment. Everyone anticipated the situation intensifying unless the suspect was provided a new phone. Something had to be done. The first attempt to deliver a phone with a law enforcement robot failed. As it had a technical failure. The incident commander looked at Chief Rogers and asked if the phone could be delivered with a drone. “Of course we can, we’re firemen,” Chief Rogers responded. Keenan got to work immediately. 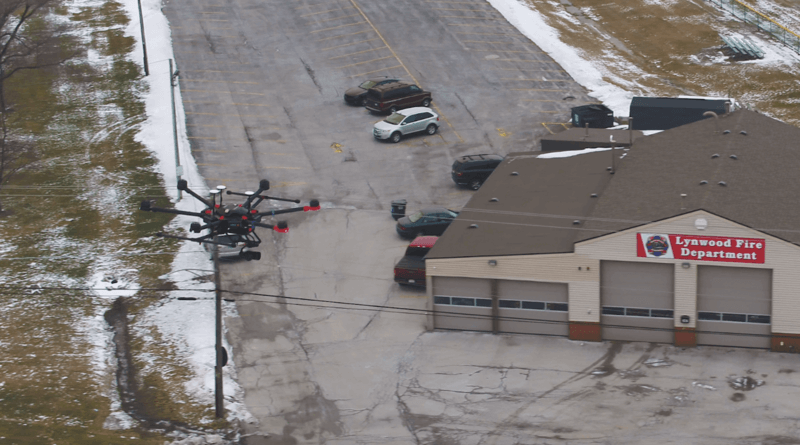 Utilizing a drop release system, a remote-controlled drop mechanism used for deliveries, on a DJI M600 Pro drone, he would attempt to swing the phone into the suspect’s bathroom window. Two Inspire 1 drones were flown nearby to help spot and guide the drop, as well as record the delivery. 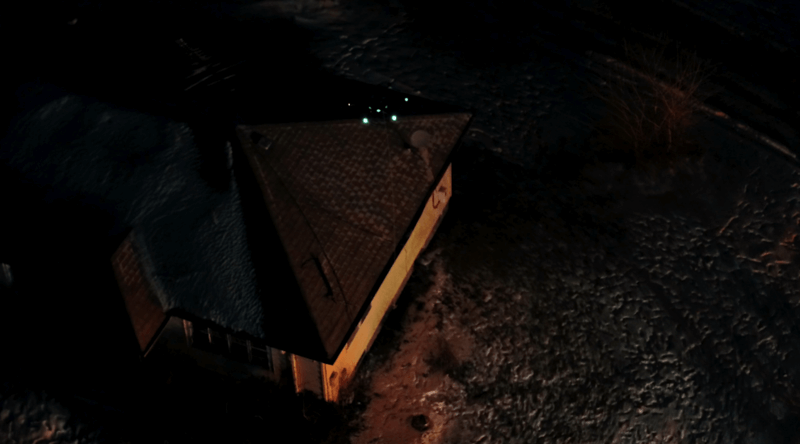 The cell phone was tied to a rope, and within minutes the drone was hovering over the house. Approaching carefully, Keenan successfully positioned the cell phone just outside of a window and swung it towards the bathroom window until the suspect grabbed it. 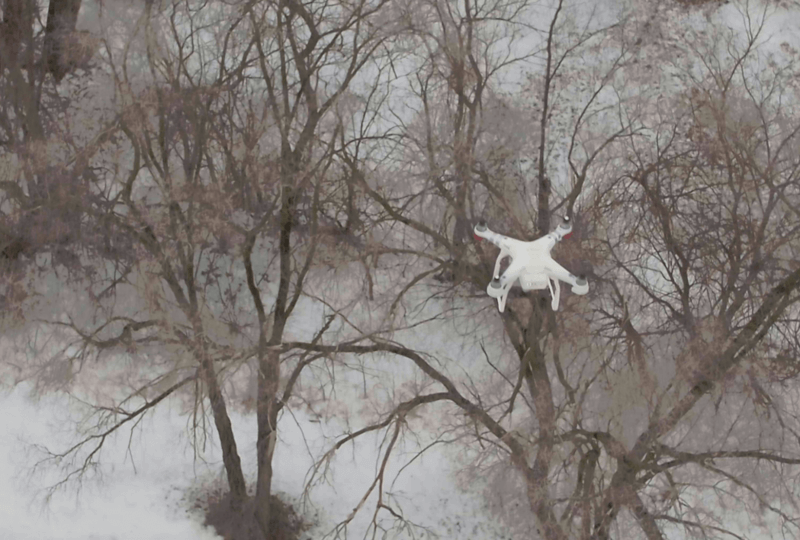 “I released it from the drone, and five hours later he surrendered peacefully,” said Keenan. “I would call it a life-saving operation. Many incidents like this have escalated to the point of putting both suspects and officers were put at risk of lethal harm. Keeping lives safe and out of harm’s way is one of the core value propositions of having drones on our fire department,” commented Keenan. As successful as Keenan and the Lynwood FD was that night, Fire Chief John Cobb was once skeptical of having a UAS program. “At the time, I saw drones as more of a toy than a functional part of the fire service,” said Chief Cobb. However, a search and rescue incident occurring in December 2016 changed his mind. Two people in a vehicle ran off the road and into a retention pond. A witness nearby stopped his car and headed to a nearby bank. Before reaching the entrance, he peered back after hearing one of the passengers struggling to get out of the water, yelling for help for him and his friend. The witness rushed to his car to call 911, but when he got back, the man was gone.The Lynwood Fire Department responded immediately and requested dive teams and additional water rescue resources from surrounding communities. The city of Chicago sent out a helicopter to aid in the search. However, it had no luck and returned when it ran low on fuel. The fire chief then called Keenan. Keenan arrived with his drone and launched it within minutes, picking up where the helicopter left off. As the afternoon wore on, the dive team eventually found the car but had yet to locate the second victim. The temperature continued to fall rapidly, re-freezing the broken ice. When night fell, the recovery efforts halted. 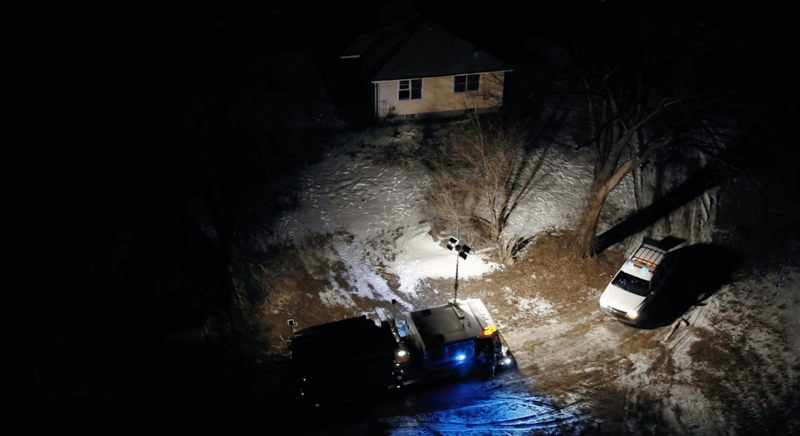 The next morning, Keenan utilized his Phantom 3 Pro to create a map of the incident. This map would help to determine the best possible location to start looking for the second victim. When recovery efforts could safely resume, the second victim was found within 30 minutes. 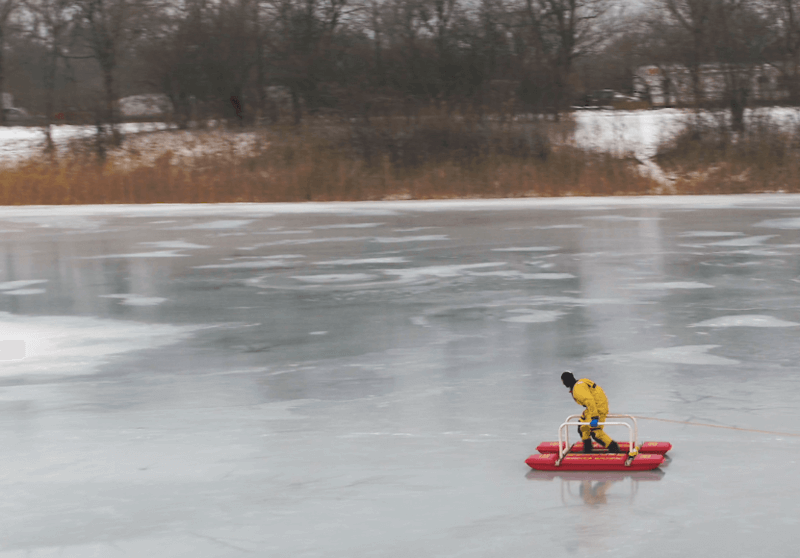 Due to the dangerously cold weather and ther hazards associated with diving under ice. This effort could have otherwise taken days longer to accomplish. More importantly, it led Chief Cobb to change his stance on drones, and he gave Keenan the go-ahead to start a UAS program for the department. Funding the program with a limited a budget was the first challenge for the Lynwood FD, something that many mid to small-sized departments face. One way around this was through donations and contributions. A local member of the community provided Lynwood FD's with its first drone, and donations remain a key source of funding for the program today. Over time, these generous gifts began to prove their value. The defining phone delivery and water recovery incidents not only demonstrated the value of having drones in the field, but it also served as an essential experience used during future endeavors. The drone program continued to grow after multiple successful missions, which meant Lynwood FD was able to acquire more funding. Currently, they have three drones that they regularly use, including a DJI M600 Pro, a massive, rugged drone built for enterprise usage. 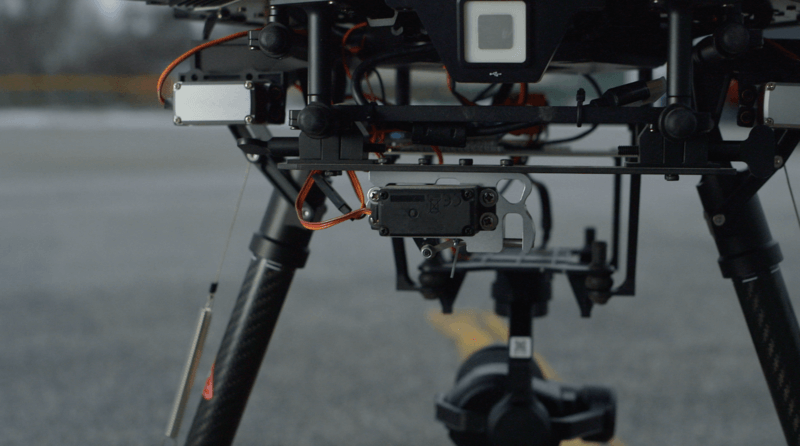 DJI has continuously collaborated with small-sized departments like Lynwood by offering educational programs and hands-on training in drone technology and R&D. To learn more about past projects read our DJI Enterprise White Paper. Drones are changing how government agencies serve the public in big ways and small. While drones have gained an early foothold in public safety, enterprising government agencies and departments are exploring their use in other areas, from transportation and public works to planning and environmental services. For more information about setting up a drone program and learning about best practices to consider as you evaluate how drones could help meet the needs of your community, download this comprehensive report.